My husband has set his running clothes out for the morning, thoughtful as he is not to wake me at 5am when he will get up for the run. He will join my brother, for an 8km run at 530am at Safa Park, when the temperatures will probably be at 35c and not the four intolerable degrees higher, when I wake up with the kids an hour later. Welcome to Dubai at the summer's start! My children have traded golf clubs for ice skates and tennis racket for indoor climbing gear. It is too hot to do anything outdoors anymore, least to go to the park. In the winter months, we go to the parks, be it Zabeel park close by, Creek park further, Satwa or Safa2 parks when we seek a smaller venue with more playgrounds. 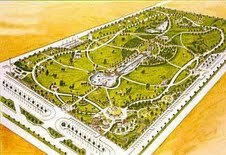 But Safa park remains the most popular destination, the Central Park of Dubai. Rumor is that the pink flamingoes that have found refuge and home in the small marshes, had stopped midway in their hibernation flight, confused by the large acre of greenery that is Safa Park, which appeared in the desert twenty five years ago. Today, these birds may be disoriented by the equally large golf courses that abound in Dubai, but the impact of Safa park on migratory birds was revolutionary. Its the instance in Rio (Disney movie about birds) when one flamingo will tell the other: "hey! Is that the new motel? How about we check in?" (Disney's line would be exponentially more humorous). We often go to Safa park to play soccer. The whole city's soccer amateurs seems to agree that its the place to play soccer. Everywhere you go, you see makeshift goals, coaches with their classes, or older players from all the continents, playing soccer. My children also celebrate their birthdays at Safa Park. Safa Park would be one of the most casual venues for a birthday party because there are no picnic tables. The birthday snack will consist of RoundTable Pizza ordered to the park, boxes and boxes of Krispy Kreme donuts and a birthday cake. Two soccer coaches will play with the forty children invited (mostly boys because my daughter may be the only girl in Dubai who actually thinks soccer is cool). Last night, I asked my kids about the cars that were filling the Safa park lot, past the closing hours, in pitch darkness. Why were they parked there? They pondered the question, wondering if a special match was on, or if people of neighborhood couldn't find parking, or if the gardeners had their cars parked. Then my daughter remembered: "it is for the people who walk around the park. Like baba who runs." 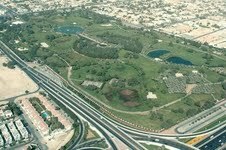 The perimeter of Safa Park is surrounded by a walkway that is softened to receive better impact for walkers and runners. Around the clock, people will be found walking incessantly. I have done it with my children in strollers or on occasion with my parents who walk there almost daily. My husband has ran there with most of his running pals, or on his own. Many in Dubai have tried it, at least once. If I were an installation type artist, I would leave a single camera in one spot on the walk and take shots on the hour as people pass, of all types and ages and sizes and colors. The desperate housewives after the school drop offs, the children who try to access the gates after school, the soccer players, the joggers, the runners, the walkers, the athletes, the covered, the bearded, the scantly covered....I have seen people walk and run in the middle of the night, at any given time, at all temperatures. I believe the circumventions around Safa Park have never ceased, even if its just a lone soldier in the depth of the night. As if the energy of Dubai is dependent or represented by the walk! PS. The paragraph about flamingos and bird migration is for the birdwatcher Jonathan Franzen, in case he were googling flamingos in Dubai. Hello! We intiated the walking path of Safa Park couple of years ago until we abandoned it for the walk path of Jumeirah Beach which is more open and healthier to breath during the heat season.Now the blogger claims it as her husband's choice?! Putting teasing aside,the Dubai Government is to be highly commended for spreading greenery and miles upon miles of flower beds all over the City.It is true that Singapore is the Garden State,but it has rain year round.Dubai is the Oasis of Greenery and colourful Flowers putting all other cities even European and American to shame.